Macroalgae, or seaweeds as they are sometimes called, hold an awkward place in the reef hobby. If they are not being used for utilitarian purposes in a refugium, they are either considered as food for herbivores, or seen as the scourge and plague of otherwise well-run systems. This series will focus on algal marine plants and attempt to highlight their more desirable and beautiful attributes. We will also cover the husbandry and identification for commonly encountered macroalgae, and review some of the interesting habitats macroalgae inhabit in the wild. Whether you love them or hate them, algae are an inevitable part of reefkeeping. And yes, the word "algae" is plural. "Alga" is actually the correct term for a single species and the word "algae" is used to refer to several species, or a group, of these primitive autotrophs. It is also fairly common to encounter "macro" as shorthand for macroalgae in everyday speech and in written content. The word "macroalgae" prompts a definition, and it could be loosely defined as "algae that are visible to the naked eye." They are not microalgae or phytoplankton, though several species' spore stages have been misidentified as species of phytoplankton in the past. It would be helpful if we could say that macroalgae consist of many cells, and microalgae of a single cell, but this is not always the case. 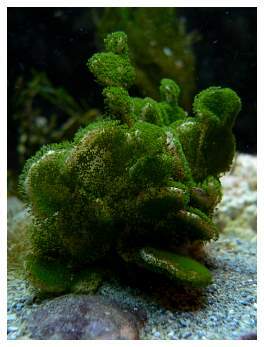 Several macroalgae are single-celled, including Acetabularia (or mermaid's wine glass) and Caulerpa. Additionally, we could argue that dense blooms of phytoplankton are visible to the naked eye. So, we begin with a bit of an enigma. Seaweeds are primitive forms of plants, but because they lack vascular tissue, they are definitely algae. 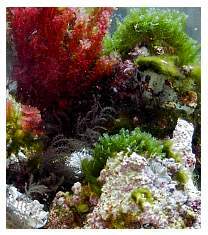 Macroalgae species are split into three groups based on their photosynthetic pigments: Phaeophyta (the browns), Rhodophyta (the reds) and Chlorophyta (the greens). Macroalgae fall into two camps among most aquarists: the dreaded volunteers that grow out of our live rock, and the useful refugium or decorative species that are deliberately added to a system. I use the term "volunteers" to describe macroalgae hitchhikers because they are rarely visible on freshly purchased rock. They seem to arrive out of nowhere after a few months or years of dormancy. These volunteers grow from resting spores, which act as dormant "seeds" that wait until their growth is triggered by suitable environmental conditions. Several of these volunteers are entirely harmless, though perhaps unsightly. They do not typically grow fast enough to be truly noxious, and do not greatly affect water quality in the system. I have noticed that if these volunteers are the only major photosynthetic organisms in an aquarium, they can dominate the system (see photo below). However, macroalgae belonging to the genera in Table 1 (below) are typically favorable finds in an aquarium and can be controlled with a little monthly pruning or with herbivores if they aren't desired in the aquascape. Neomeris sp. Photo courtesy of Ryngill. Padina sp. (left), Batophora sp. (right). Photos courtesy of Morten Nordby (left) and Ken Lunde (right). Other volunteers are more aggressive competitors for nutrients, light and space, and should be culled from the tank as soon as possible. 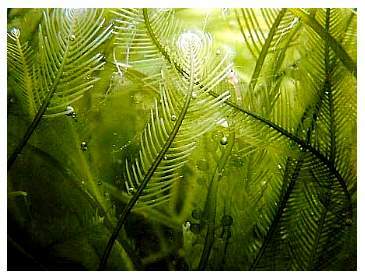 These include Dictyota, Bryopsis (feather algae) and Caulerpa. 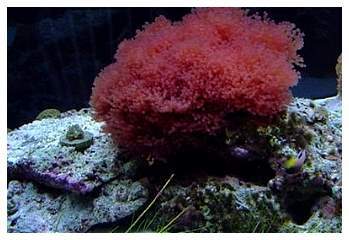 Two groups of macroalgae are known by descriptive terms such as red "cotton candy" algae and red turf algae. Both are menaces in reef aquariums because they can quickly overgrow corals and other sessile invertebrates. Red turf algae, possibly Asparagopsis sp. Photo courtesy of Marc Levenson (melev). One of the first questions reefkeepers have when they spy a macroalga in their system is - what, exactly, is it? While many genera of macroalgae are fairly easy to identify by appearance alone, most cannot be identified to species level without an expert education in phycology (the study of algae). Identification of red algae, in particular, is a painstaking affair, because there are more species of red algae than green and brown combined. If you are adventurous (or curious), several excellent guides to macroalgae identification are available, including D.S. Littler's classic, Marine Plants of the Caribbean. The image search feature at AlgaeBase.org is also invaluable, as is the image search available through Google.com. The drawback to both of these sites is that they require a few guesses as to the name of the algae before they can begin searching. It would be impossible to provide a guide to every macroalga we encounter in our systems, but several galleries are available online, including Algae Album - An Algae ID Slideshow and the Algae Page. Even with these visual aids, a proper identification is not guaranteed since some species (especially the reds) can only be accurately identified through the use of a microscope and access to their other life history stages. Instead, for some of the nuisance algae, it is more important to know how to deal with them than to know their exact name. For Dictyota, Caulerpa and any of the less aggressive macroalgae, manual removal is sufficient to rein in small patches of them. It is important to remove all the algae, including any small pieces that have broken off, or these may holdfast to a new area of rock and colonize other parts of the system. 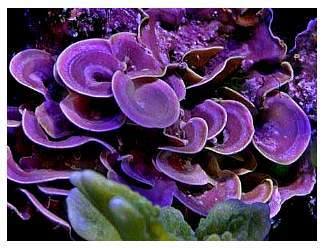 Botryocladia, a red grape algae, grows quickly under intense lighting in this seagrass aquarium. Photo courtesy of Scott Fellman. Many reefkeepers also have success using rabbitfish, triggerfish and Turbo spp. snails to keep their rock clean. For hair algae invasions, sea hares are being used successfully along with lawnmower blennies and emerald crabs. Truly desperate reefkeepers can employ long spine urchins to try to keep macroalgae from taking over their tank, or they may opt to remove the affected rock and clean it of the algae entirely outside the aquarium. For the best information on controlling Bryopsis, red turf and "cotton candy" algae, the following linked threads have invaluable front-line advice: Red cotton candy algae and Bryopsis. In your battle against algae, it is useful to know a little about the basic life cycle of macroalgae. Most algae follow a fairly predictable life cycle defined around their reproductive stages. It is not entirely unlike the life cycle of coral, including a pelagic spore stage and a dominant benthic stage. 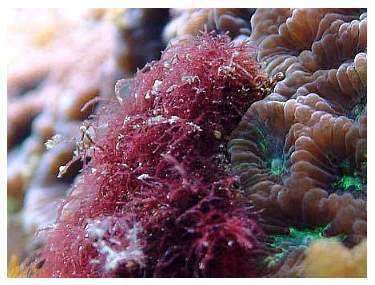 In addition, macroalgae can remain dormant as resting spores attached to the substratum, which is a departure from the typical life cycle of coral. Most species of algae grow attached to the substratum from a spore (analogous to a seed of higher plants) in a vegetative, growing phase of life. An environmental trigger is typically required to initiate the reproductive phase of life, which starts with the formation of gametangia in, or on, the algae. These structures hold the spores, the gametes of macroalgae. Spores are released from the parent algae after the parent's tissues lyse, or break open and die. 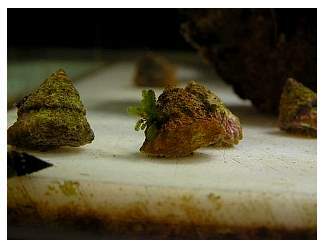 Macroalgae can spread in an aquarium, and in the wild, by either growing over substrata, breaking off and vegetatively colonizing a new area, or settling onto a new spot as a spore. Algae happily grow in the vegetative stage of their life cycle until their environment no longer supports their growth. Or, in other words, they grow until they run out of food. In our closed systems, algae take up the nutrients produced by the aquarium's bioload. The trouble is, it's easy to run out of the proper ratios of nutrients that algae need to stay in the growing phase of their life. The best defense against sexual macroalgal events, particularly in Caulerpa, is a good offense. Regularly trimming refugium algae is a necessity in reefkeeping. Not only does this continuously export the nutrients from your tank, it ensures that the macroalgal biomass does not get too large for the tank's bioload to support. In addition, iron supplementation may be useful in aquariums with plentiful sources of nitrogen and phosphorous, but where refugium macroalgae still look pale and grow slowly. We truly need more data on iron supplementation and its effects on macroalgae, fish and other invertebrates. Halimeda sp. Photo courtesy of Mike Feely. Another area which would benefit from a little more investigation is the potential benefits and risks associated with continuously lighting a refugium. Many reefkeepers use a twenty-four hour photoperiod over stands of Caulerpa to prevent sporulation. Considering the reports from aquarists, this method does work. We do not know, however, if growth rates are better when using other photoperiod conditions compared to twenty-four hour cycles, or if continuous light simply delays an inevitable sporulation event. Green macroalgae, however, will show warning signs of impending sporulation, or sexual, events. Both Halimeda and Caulerpa bleach slightly and show several hundred tiny green dots on their surface just prior to releasing their spores (see photo-right). Any algae suddenly covered in these spots should be quickly removed from the tank. Sporulation events can be disastrous in reef systems because the spores are released along with all the cellular contents of the alga. These contents break down in the aquarium and can overload the biofilter causing dangerous spikes in ammonia, nitrite, nitrate and phosphate levels. The break down of all these organics can also strip the water of oxygen. Additionally, several genera of macroalgae contain toxic compounds meant to discourage herbivores from consuming them, including the toxin caulerpenyne found in Caulerpa. A few other species contain antibiofouling toxins that discourage larval invertebrates and spores of other macroalga from settling on their frond surfaces. While there are no studies that reveal the toxicity of these compounds to fish and invertebrates in aquarium environments, it may be prudent to attempt to clear them from the water rather than risk poisoning tank inhabitants. If the macroalga succeeds in releasing spores into the tank, the damage to the system can be minimized by acting quickly. Use prepared make-up water to do several small water changes in the system in the days immediately following the event to help clear decomposing tissue and spores from the water. Run carbon in filters and pay attention to the protein skimmer to ensure that the system is adequately filtered. Additionally, consider additional aeration as insurance for the fish and other inhabitants. Beyond the nuisance and volunteer algae, some useful and decorative genera are available in the trade today. Both Sargassum and Halimeda, which often are volunteers, can be beautiful additions to an aquarium. 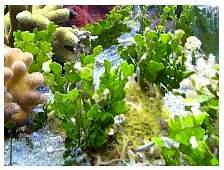 Halimeda is a calcareous macroalgae, and takes up more calcium, magnesium and alkalinity than other macroalgae, so attention should be given to these levels when maintaining lots of coral and large stands of Halimeda. For the refugium, Ulva (sea lettuce), Chaetomorpha (spaghetti algae) and Gracilaria ("tang heaven") all make excellent fast-growing nutrient exporters, and double as food for herbivores and copepods. All three can exist in a refugium without being tumbled in high circular flow, but they do best when they spin and all areas of their biomass are constantly exposed to light and nutrients. All three of these algae can tolerate both very low and very high light levels, and can live through hypo- and hypersalinity treatments in quarantine and hospital tanks. In the case of Chaetomorpha, its only drawback, is the ability to fragment into short segments in place of a typical sexual event. Fragments of Chaetomorpha often break off the main colony and find their way into overflows and pumps, where they can clog the intakes and cause floods. 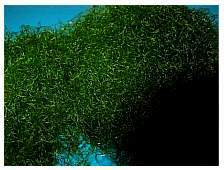 To prevent this from occurring, trim Chaetomorpha frequently, routinely shake it free of any collected detritus, and expand or turn the mass of strands to allow all the cells access to light. Ochtodes (blue ball algae), Acanthophora (spiny seaweed), Botryocladia (one of the common red grape algae) and Halymenia (dragon's tongue macroalgae) can also be decorative accents in a reef tank. However, these are not all the macroalgae that could be suitable in a reef environment. As more reefkeepers embrace the use of macroalgae in their systems, we may discover more suitable (and beautiful) species to propagate. It is also possible to build a marine planted tank that will sustain only macroalgae. Such a tank could also maintain most of the Caulerpa species, because there would be no risk of the algae overgrowing corals. 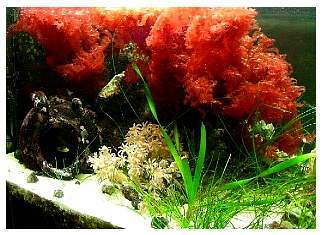 Generally, a planted tank full of macroalgae can be set up as an attractive refugium. Macroalgae do well in a range of light and salinity. It would be impossible to definitively list the light requirements of all the available species here, but the general range of 60 - 150 PPFD is more than enough for red, green and brown macroalgae. Like seagrass, they benefit most from daylight bulbs (regardless of whether the lights are T5, power compacts or metal halides) in the 5000 - 10,000K range. A planted tank, like a refugium, also needs nutrients from the bioload in order to prosper. Algae can be transplanted into new areas of the tank, or from sources outside the tank, by attaching small segments to rubble or live rock. However, many macroalgae do best in sand and can be placed directly into a (minimum) 1" deep sand bed (see Table 2 for a list of common macroalgae and their placement in a system). The fragments can be attached with coral frag glue, or simply by gently tying them in place with string or fishing line. Holdfast tissue, which lashes the algae to the rock, can take weeks to form but will eventually grow into the new substratum and complete the transplant. Halimeda sp. (left), Fauchea sp. (center) and Chaetomorpha crassa (right). Photos courtesy of Howard Pierce (left), Marc Levenson (center) and Gary White (right). Systems full of macroalgae serve as excellent homes for seahorses, pipefish, clownfish, gobies, pistol shrimp and other aquarium fishes and invertebrates. Aquarists who find macroalgae to be an interesting departure from the more common reef inhabitants may also merge them with seagrasses, or choose to replicate macroalgae-dominated habitats. Two particularly interesting ecosystems rely on macroalgae: the coldwater kelp forests off the California coast, and the Sargasso Sea in the Atlantic Ocean. Macroalgae are also important in the turnover of nutrients within coral and oyster reef ecosystems, and perform this role in seagrass beds when the true plants are dormant during winter. The kelp forest is one ecosystem that is rarely replicated in aquariums due to its need for very large aquaria, extensive chilling and access to bright light. 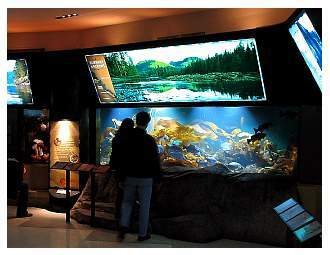 One of the most successful live kelp displays is the Kelp Forest exhibit at the Monterey Bay Aquarium, shots of which stream live on the Internet. This forest is home to many beautiful coldwater fish including Garibaldi, rockfish of all colors and stripes, anemones, sheepsheads, leopard sharks and wolf eels. A setup recreating this environment would definitely fall within the realm of advanced aquaria. 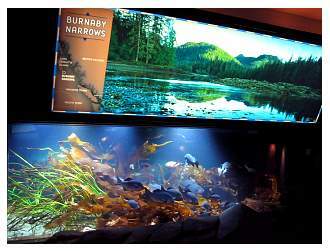 There is also a small scale live kelp display (photos below) at the Vancouver Marine Science Center, in Vancouver, Canada that is more along the scale of what could be accomplished in a home aquarium setting. A live kelp display at the Vancouver Marine Science Center. Photos courtesy of J.C. Delbeek. A pelagic Sargassum system might be considerably more within the reach of most aquarists. This macroalgae floats within a small area defined by currents within an area of the Atlantic Ocean known as the Sargasso Sea. Many hundreds of fish species grow up within the floating algae's shelter, as do newly-hatched sea turtles. The algae here literally form life rafts and oases within the open ocean's desert-like conditions. A system with floating Sargassum, and a bit of underlying rock and sand, would certainly make a dramatic stage for Sargassum-associated filefish, anglers and seahorses. Members of the Sargassum genus can be found in other areas of the world, including as rafts within the Pacific and Indian Oceans. Finally, one of the easiest macroalgae dominated tanks to create may be a volunteer alga garden. One of my personal favorite methods of acquiring macroalga is to find live rock covered in small segments that are typically cast aside by other reefkeepers. These make excellent seed rocks for your evolving marine planted tank, and it can be interesting to watch the alga grow and take shape in your system. If your live rock doesn't sprout enough biodiversity for your taste, fragments of macroalgae ship well from fellow reefkeepers and are often easy to finesse from your favorite reef shop. Pictured on the left is a macroalgae garden including Acanthophora, various Caulerpa and Botryocladia. Halymenia (right photo), dragon's tongue algae, grows quickly under intense lighting in this seagrass aquarium. Left photo courtesy of Bruce Watts; right photo courtesy of John Boiger. Humans use macroalgae outside aquariums in several ways, including consuming it whole as nori or wrapped around sushi. Derivatives of macroalgae are routinely used as thickening agents in food. The polysaccharide carrageenan can be found in many products including ice cream, vegan Jell-O, soy milk, shampoos, fire-fighting foam, several toothpastes and even in beer, where it is employed to remove residual haze. 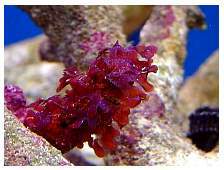 These uses arise from several species, principally Chondrus crispus, also known as Irish moss, a red macroalgae typical along coldwater coasts. Interestingly, researchers from the National Cancer Institute recently published findings that carrageenan had properties that decreased human papillomavirus infections of cells in laboratory screenings (Buck et al., 2006). The current research boom in biotechnology may increase the use of algae in our society. Instead of new pharmaceuticals from the rainforest, we may be obtaining them from the oceans. In fact, algae already speed along research on college campuses and in private laboratories worldwide, as the polysaccharides agar and agarose. These are also derived from red macroalgae, and are used to form the gel used to create Petri dishes that researchers use to work with bacteria, fungi, animal cells and phytoplankton. They are also used in a slew of experiments to study genes and DNA. Closer to home, the recent resurgence of holistic and homeopathic medicine has renewed interest in the use of macroalgal extracts. Lining supermarket shelves, many of the lotions, creams and moisturizers that claim to firm skin also contain extracts from macroalgae. And, in perhaps one of the more bizarre and interesting uses of macroalgae, vegans and other people interested in organic clothing have turned to Seacell, which combines seaweed and wood pulp to produce a fabric that claims to nourish skin as you wear the garment. Clearly, macroalgae aren't just in your aquarium. Finally, no article on macroalgae would be complete without a warning to the reefkeeping community about invasive species of algae. Many of us are aware of Caulerpa taxifolia, the so-called killer alga that invaded the Mediterranean in 1984 and later turned up on the coast near San Diego, California in 2000. Nine species of Caulerpa are banned in California, including C. taxifolia, C. racemosa, C. cupressoides, C. mexicana, C. verticillata, C. sertularoides, C. ashmeadii, C. floridana and C. scalpelliformis. Generally speaking, if its morphology at all resembles a feather or a grape, it is not welcome in California. As responsible aquarists, we need to remember that our fish are not the only creatures in our care that can damage an ecosystem. It is very simple to add bleach to old water during maintenance to kill organisms from the tank, and to kill any harvested macroalgae before pouring the tank water down the drain. Or, if you're opposed to bleach, freezing the alga, or leaving it out to dry completely, is also effective. 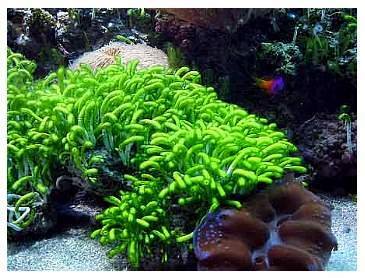 Currently, the marine aquarium trade has grudgingly accepted macroalgae as refugium exporters. However, macroalgae may still have some useful secrets to yield to marine aquarists. Macroalgae already do so much for our society and our oceans that they may certainly give some benefits to reefkeeping - as exporters, as decorative accents and as a new habitat in marine aquaria. I would like to thank John Boiger, Scott Fellman, Mike Feely, Marc Levenson, Bruce Watts and J. C. Delbeek for the use of their photographs and their comments during the writing of this article. I would also like to thank those that participate in the Marine Plants and Macroalgae forum on Reef Central for their contributions to this fledgling branch of the hobby. Adams, K. 2004. Halimeda: The Cactus Algae. Reefkeeping Magazine, 3(3). Buck CB, et al. 2006. Carrageenan is a potent inhibitor of papillomavirus infection. PLOS Pathogens. 2 (7). Holmes-Farley, R. 2002. Iron in the Reef Aquarium. Advanced Aquarist, 1(8). Littler, D.S., M.M. Littler, K.E. Bucher, & J.N. Norris. 1989. Marine Plants of the Caribbean. Smithsonian Institution Press. Washington, DC. Littler, D.S., M.M. Littler. 2000. Caribbean Reef Plants. OffShore Graphics, Inc. Washington, DC. Littler, D.S., M.M. Littler. 2003. South Pacific Reef Plants. OffShore Graphics, Inc. Washington, DC. Lobban, C.S. & M.J. Wynne ed. 1981. The Biology of Seaweeds. University of California Press. Berkeley, CA.